I was delighted to be a part of a meeting in July 2015 of the second cohort of Maryland’s Promising Principals. These 48 young educators, selected by their local superintendents to participate in the Promising Principals Academy, embody what is right in education today and they represent Maryland particularly well. During this, their first “convening,” they participated in a variety of activities designed by MSDE staff and six former Maryland school principals, including myself, who were hired as coaches to work with teams of eight promising principals throughout the year. The focus of the four-day meeting was on knowing yourself as a professional and developing yourself as a leader. In addition to some human synergy and team-building work, the participants had a chance to explore their personality types, jell as a group, and begin to examine the skills good leaders need to hone as they become the next generation of principals in Maryland’s nationally recognized school systems. 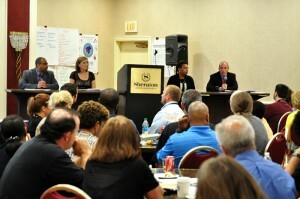 The final day of the convening included a panel discussion featuring four school leaders who had been a part of the first cohort of Promising Principals, participating in the Academy program last year. The panelists assured the new group of aspiring school leaders that the year-long leadership training program is worth their time, personally enriching, and will help them develop a network of peers they can call on for support and guidance as their careers advance. advised the 2015 cohort to take full advantage of the experience and to immerse themselves in the activities and learning. He said that letting the excuse of “being busy” to interfere with full participation would be a mistake that they would later regret, adding that this is a leadership development opportunity that most people don’t get. In other words, take advantage of this unique experience and get everything you can out of it – an important tip as this new group of Promising Principals begins an intense year of professional growth and learning that is certain to take them out of their comfort zones to reach new heights.